Wisconsin Wrongful Death Drunk Driving Cases | Hupy and Abraham, S.C.
Is It a Good Idea to File a Wrongful Death Case After a Fatal Drunk Driving Accident? 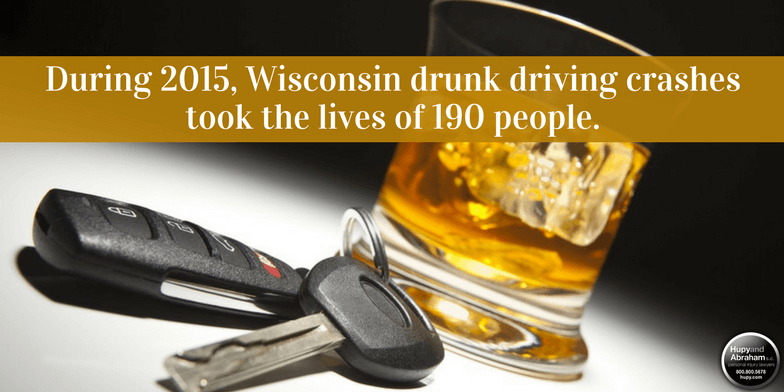 During 2015—the most recent year for which complete statistics are available—190 people died in Wisconsin drunk driving crashes. One hundred ninety lives were cut short and the families and loved ones of 190 people were left grieving unnecessary and unimaginable losses. In each of these cases, the drunk driver got behind the wheel and put other people’s lives at risk. Now you have a decision to make. Will you take action to hold the drunk driver accountable and protect your family’s financial future? Will You File a Wrongful Death Lawsuit? The driver. It was the driver who decided to drink and get behind the wheel of a car, and it is the driver who may be legally responsible for your loved one’s death. A “social host” if the driver was under the age of 21. A social host is an adult who knowingly and willingly provides alcohol to a minor at a party, at home, or anywhere else. A “dram shop” if the driver was under the age of 21. An establishment such as a bar, restaurant. or store that sells alcohol to a minor may be liable for a resulting drunk-driving death. You would need to prove that the teen driver was drunk because of the alcohol provided by the social host or business in order to recover damages from one of these potential defendants. Why File a Wrongful Death Case If a Criminal Case Is Pending? A civil wrongful death case, brought by the survivors of the person who was killed in the drunk driving accident and a criminal DUI case brought by the state of Wisconsin, are independent legal proceedings. Evidence needed for the plaintiff (in a civil case) or prosecutor (in a criminal case) to win. As the plaintiff in a civil case, you do not need to prove beyond a reasonable doubt that the driver was drunk when he or she killed your loved one. Instead, you need to prove that the driver was negligent by a preponderance of the evidence—meaning that it was more likely than not the driver’s negligence that killed your loved one. Potential damages and punishments. Only a criminal case will result in jail time. Likewise, only a civil case will result in damages for you. Thus, the possible outcomes of a criminal case and a civil case are different. Accordingly, in order to protect your family’s financial future and legal rights it is important to pursue a civil wrongful death case even if the state of Wisconsin is pursuing criminal charges against the drunk driver for violating the law. What Will You Recover in a Wrongful Death Case? Medical expenses. Any health care costs that your loved one had between the time of the accident and the time of death may be included in a recovery. Funeral costs. The cost of a service, cremation, burial, or other memorial may be included in your recovery. Lost income. Any wages, benefits, or income from being self-employed that your loved one was unable to earn from the time of the accident until what would have been her reasonably anticipated retirement date may be compensable. Out-of-pocket costs. Any expenses incurred by your family due to the loss of your loved one may be included in your recovery. Pain and suffering. Your loved one’s physical pain and emotional suffering from the time of the accident until the time of death and your family’s emotional loss may be included in your recovery. Even though you have suffered the most unimaginable loss due to someone else’s decision to drink and drive, the insurance company is still unlikely to provide you with a fair settlement unless you fight for it. You don’t have to fight alone, however. You have the right to work with an experienced wrongful death attorney who will fight hard for your recovery of damages after this type of wrongful death. To learn more, please reach out to us at any time—24/7/365—via this website or by phone.